Am morgen erreichten wir nach langem Flug endlich unser Ziel. 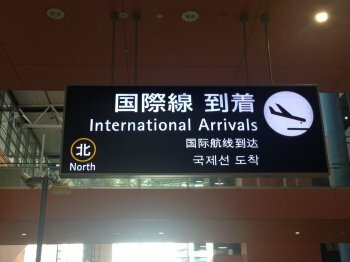 Mit etwas Müdigkeit in den Knochen ging es vom Flughafen in Osaka weiter nach Kyoto. After a long flight we finally arrived at our destination in the morning. A little tired we headed from Osaka Airport to Kyoto. Nach unserer Ankunft in Kyoto machten wir uns erst mal auf die Umgebung zu erkunden. 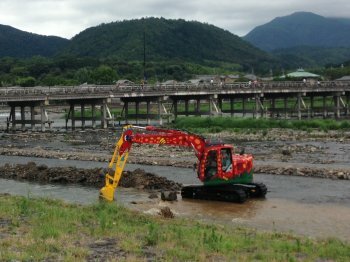 Ein Picknick am Kamogawa Fluss gehörte auch dazu. 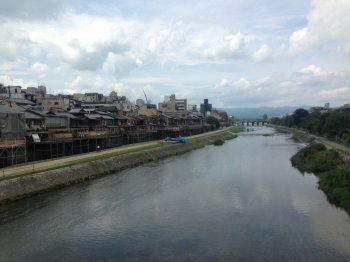 After our arrival in Kyoto we first got familiar with the district of our hotel, including a picknick at the nearby Kamogawa river. Unser Weg führte uns zum Yasaka Schrein, wo wir uns mit der religiösen Seite Japans vertraut machten. Rituelles Händewaschen gehört hier genaus dazu, wie vor dem Beten in die Hände zu klatschen. Our way lead us to Yasaka Shrine, where we got familiar with Japans religious side. Purifcation of hands and mouth are as important as clapping into your hands before the prayer. 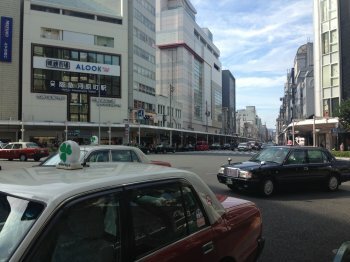 Wir sind zwar noch nicht in den Megastädten wie Osaka und Tokyo, aber auch in Kyoto ist viel los. Umso froher sind wir, als wir dann am Nachmittag auf unsere Zimmer können. We might not be in big cities like Osaka and Tokyo yet, but also in Kyoto, there is a lot going on. Good that we finally can relax at our rooms after a long flight and day. Wir starteten diesen sonnig-heißen Tag mit einer Erkundung des Kaiserpalasts. Hier residierte der höchste Mann im Staat, bis der Hof nach Tokyo verlegt wurde. // We started our day with a visit of the empirial palace. 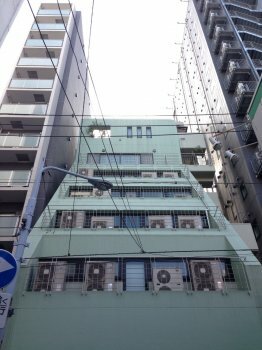 The highest man in the Japanese state used to live here, until the court was moved to Tokyo. 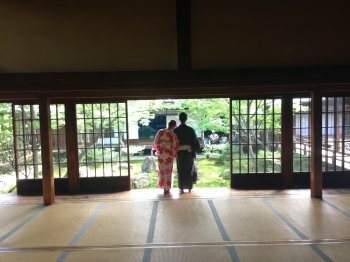 Nächster Halt was das Nishijin Textilzentrum, wo wir uns nicht nur eine Kimono-Modenshow ansahen, sondern auch selber Kimonos anprobieren konnten. 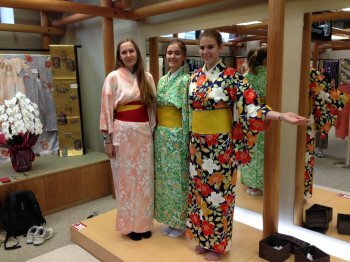 // Next stop was the Nishijin textile center, where we saw a kimono show, but also tried some by ourselves. 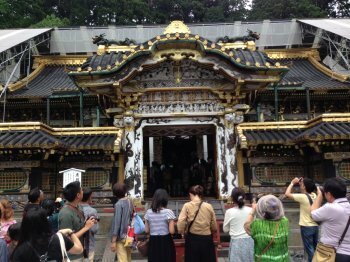 Vor unserem Besuch im Goldenen Tempel Kinkaku-ji, wird sich noch schnell gestärkt. 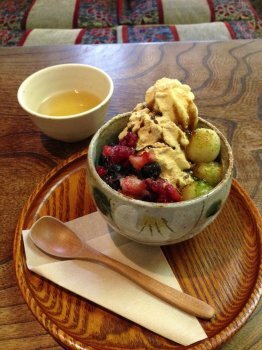 // Before going to the golden Kinkaku-ji tempel we have to get our stomachs filled. 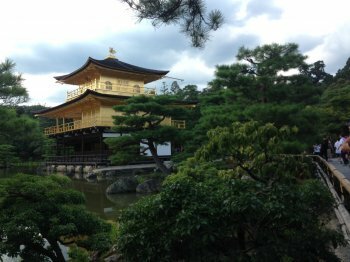 Besser nicht verpassen: der goldene Tempel Kinkakuji. // Beter don't miss it: the golden tempel KInkaku-ji. Zum Abschluss des Tages sind wir noch zum Karaoke gegangen. 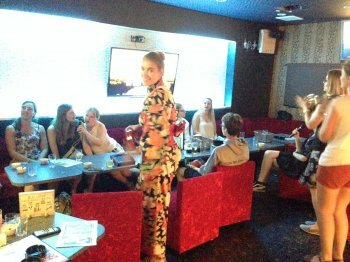 // At the end of the day we went for Karaoke. 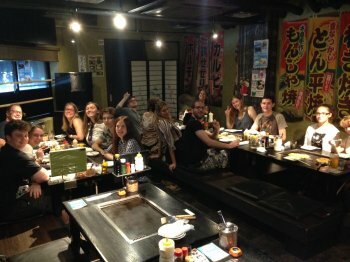 Nach einer langen Karaoke Nacht ging es morgens weiter zur Nijo-jo Burg, die alte Residenz der Tokugawa Shogune in Kyoto. 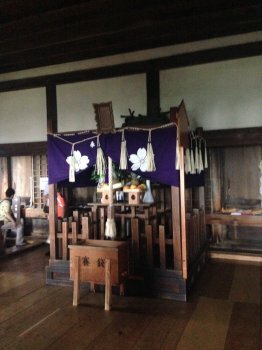 Hier erfuhren wir mehr über die Samurai, den Nachtigallenboden und traditionelle Architektur. // After a long night at Karaoke we visited the Nijo-jo castle, the old residency of the Shogung, this morning. 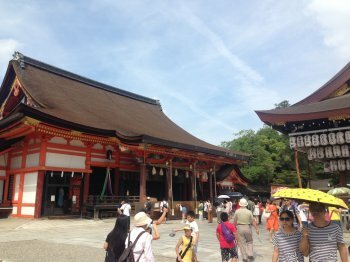 We learned more about the Samurai, the nightingale floor and traditional architecture. Nur eine kurze U-Bahnfahrt und schon waren wir in den östlichen Bergen, wo wir den Chion-in Tempel mit seinem riesigen Eingangstor besuchten. Ganz schön beeindruckend! // Only a quick subway ride and we found ourselves in the eastern mountains, where we visited the Chion-in temple with its huge gate. Very impressive! Am Nachmittag gingen wir dem Namen unserer Gruppe (Raijin) auf die Spur. 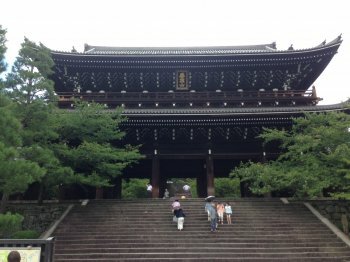 Im Kennin-ji Tempel fanden wir nämlich das berühmte Fujin-Raijin-Bild des KünstlersSotatsu Tawaraya. Raijin ist der Donnergott und Fujin der Sturmgott. // In the afternoon we traced back our groupname (Raijin). 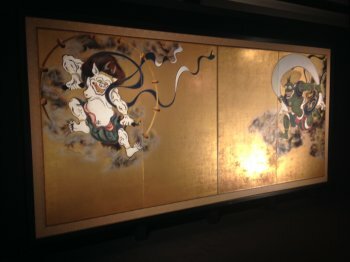 In Kennin-ji temple we found the famous Fujin-Raijin-painting by the artist Sotatsu Tawaraya. Raijin is the God of thunder and Fujin the God of Wind. 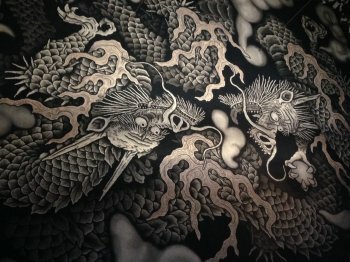 Aber Kennin-ji hatte noch vielmehr Kunst zu bieten, wie beispielsweise das gigantische Deckengemälde mit den zwei Drachen. 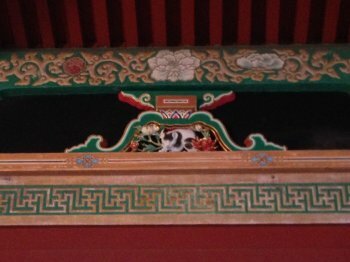 // But Kennin-ji had even more art to offer, for example the massive painting of two dragons on the ceiling. Wir lieben Kyoto! // We are in love with Kyoto! Heute führte uns unser Weg in den Westen Kyotos, nach Arashiyama. Übersetzt heißt der Ort so viel wie "Sturmberge", aber davon war heute gott sei dank nichts zu sehen. Stattdessen war es mit 35 Grad wieder ziemlich heiß. // Today our way led us to the west of Kyoto, to Arashiyama. Translated directly it means "storm mountains" but fortunately there was no storm comming up today. Instead it was really hot again, with 35 degrees. 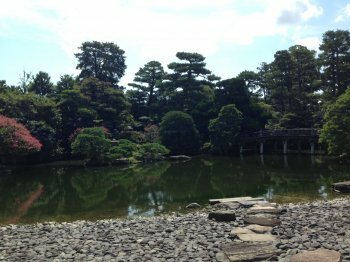 Erster Programmpunkt war der Tenryu-ji Tempel mit seinem berühmten Garten. 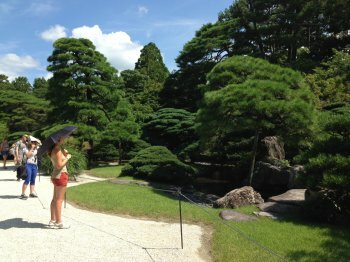 // First point of the day was the Tenryu-ji Tempel with its famous garden. 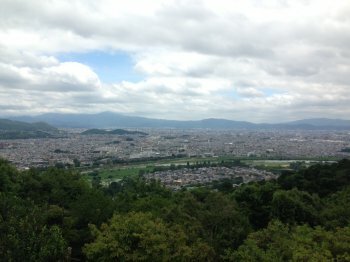 Im Anschluss durchstreiften wir den Bambuswald von Arashiyama und bestiegen den Affenberg. Die Affen laufen hier einfach frei neben den Besuchern herum und man kann sie sogar füttern. // After that we roamed around the bamboo forest of Arashiyama and climbed the monkey mountain, where the animals run freely next to the visitors. We could even feed them. Am Nachmittag besuchten wir dann den Toei Filmpark. Ob Geisterhaus, Ninjas oder Superhelden, hier gab es einiges zu entdecken. 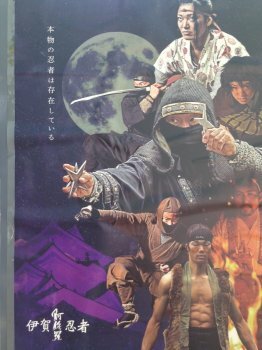 // In the afternoon we visited the Toei Moviepark, where we discovered a haunted house, Ninjas and japanese Superheroes. Im Park werden oft Szenen für historische Fernsehdramen gedreht. Man hatte fast das Gefühl im alten Japan zu sein. // In the park scenes for historical TV dramas are shot. Sometimes we really got the feeling to be back in ancient Japan. 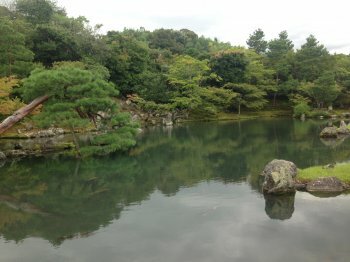 Wir ließen das schöne Kyoto heute hinter uns und besuchten Nara, die Wiege des japanischen Buddhismus. Das Stadtbild ist geprägt von ehrwürdigen Tempeln und süßen, aber ganz schön gefräßigen Rehen. // Today we left beatiful Kyoto behind and visited Nara, the cradle of Buddhism in Japan. 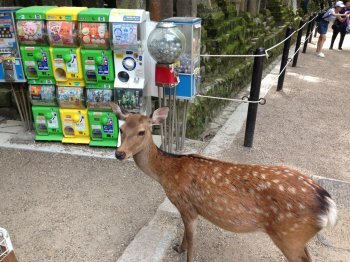 There are a lot of venerable temples here and the parks are populated by cute but creedy deers. 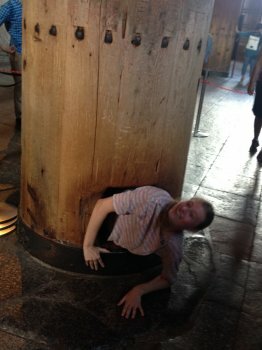 Besonders beeindruckend war der Todai-ji Tempel, das größte Holzgebäude der Welt. Ein gigantischer Bronzebuddha sitzt in dessen Inneren und ein kleines Loch in einer Säule lockt die Besucher eine Abkürzung ins Nirwana zu nehmen. // Especially impressive was Todai-ji temple, the biggest wooden building in the world. A giant bronze Buddha is sitting inside and a small hole in one of the pillars invited us to take a shortcut to Nirwana. Unsere Mittagspause machten wir in der Nähe eines weiteren Tempels mit Terrasse und toller Aussicht. // We had our lunch break near another temple with a nice terrace and a fantastic view. 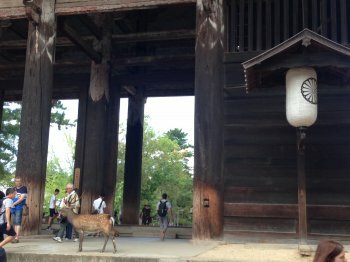 Im Anschluss machten wir noch einen Spaziergang durch einen nahe gelegenen Wald und besuchten den Kasuga Taisha Schrein, der die Stadt Nara beschützt. 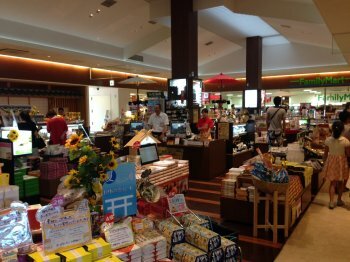 Danach noch ein wenig shoppen und schon waren wir auf dem Weg nach Osaka. // Afterwards we had a little walk through the woods an visited Kasuga Taisha shrine, which is protecting the city of Nara from evil. A little bit of shopping after that and we were already on our way to Osaka. 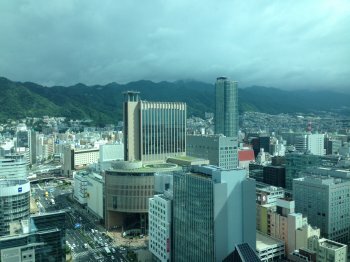 Heute ging es hoch hinaus: zunächst genossen wir den Ausblick vom 173 Meter hohen Umeda Sky Building, bevor wir danach eine Runde mit dem HEP5 Riesenrad fuhren. 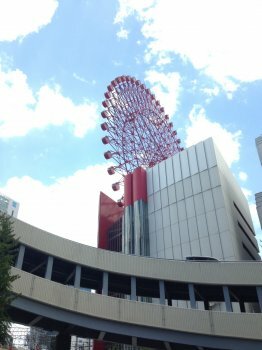 // Today we reached for the sky: first we enjoyed the amazing view from Umeda Sky Building (173 meters) and efter that we had a ride on the HEP5 Ferries wheel. 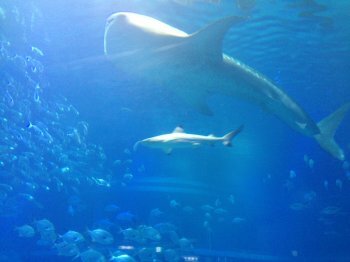 Am Nachmittag besuchten wir das riesige Aquarium am Hafen von Osaka // In the afternoon we visited the huge aquarium at the harbor of Osaka. Es gab sogar mit einem Walhai, die größte Fischart der Welt zu sehen! // There was even a whale shark, the biggest type of fish in the world! 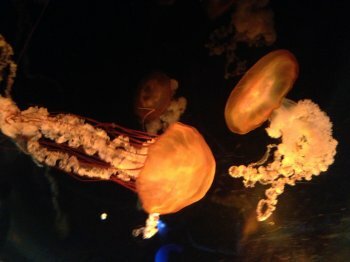 Von goldigen Clownfischen bis hin zu unheimlichen Tiefseebewohnern, wie diese japanische Riesenkrabbe, war alles dabei. 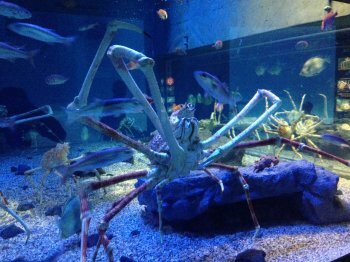 // We could find nearly everything, from cute clownfishes to creepy deep sea dwellers like this japanes spider crab. Heute war uns der Wettergott nicht gut gewogen. Ein Taifun zog auf und so mussten wir aus Himeji früher als geplant zurück fahren. Wir besichtigten zwar die fantastische Burganlage, aber mit einem Taifun ist nicht zu spaßen. Regen über Regen und Sturm war angesagt. // Today the weather god wasn't fond of us. He send a typhoon into our region and so we had to make our trip to Himeji shorter than planned. Still we had a great look around the castle grounds of Himejis famous white heron castle. Kobe war unser letztes Ziel in der Kansai Region. Von Osaka nur einen Katzensprung entfernt gilt es mit knapp 1,5 Millionen als sechst größte Stadt des Landes. // Kobe was our last destination in the Kansai region. With 1.5 Million inhabitants, it is the 6th largest city in Japan. 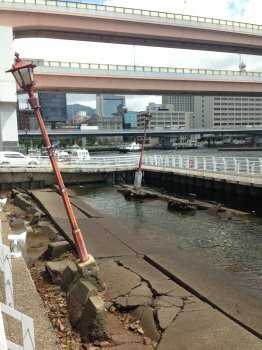 1995 gab es hier in Kobe ein großes Erdbeben, woran noch immer eine Gedenkstädte erinnert. Es ist nur schwer vorzustellen, welche Kräfte an diesem Schicksalstag gewirkt haben müssen. 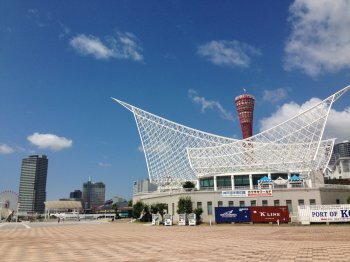 // In 1995 there was a big earthquake here in Kobe. A memorial still reminds us of that tragedy and it is hard to imagine the forces being at work on that day. Unser Spaziergang führte uns weiter am Hafen entlang Richtung China Town. Auf dem Weg erklärte uns unser Reiseleiter mehr über spannende Themen wie Minderheiten in Japan oder die Yakuza (japanische Mafia). // Our walk let us from the harbour to china town and our guide told us more about interesting themes like minorities in Japan and the Yakuza (the japanese mafia). In China Town hatten wir dann Zeit uns durch die kulinarischen Köstlichkeiten zu futtern. // In China town we could eat ourselve all through it's culinary delicacies. Tag 10Angriff der Ninja! // Attack of the Ninja! Heute hieß es sayonara Kansai, denn wir machten uns auf den Weg nach Tokyo. Aber natürlich nicht ohne Zwischenstopp. Wir besuchten zunächst den Ort Iga Ueno, der im Mittelalter berühmt für seine Ninja war. Natürlich gehörte auch eine Ninja Show und eine Führung durch ein Ninja Haus mit zum Programm. // Today we said sayonara to Kansai and started our journey towards Tokyo. But of course we also had some stops on our way. 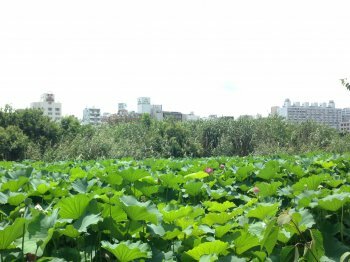 The first one was Iga Ueno, a town which was known in the past for its Ninja assasins. Of course we checked out the local ninja show and visited a ninja house. Dann ging es weiter Richtung Nagoya. Unsere Mittagspause hielten wir auf einem Rasthof ab. Wahnsinn, wieviel Angebot es hier gab. 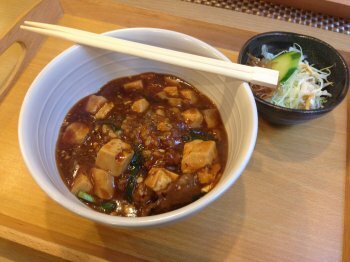 // Our next destination was Nagoya, but before that we had our lunch break at a service area beside the highway. Awesome selection of food. Dann waren wir endlich in Nagoya und besichtigten bei strahlendem Sonnenschein die Burg. Der nach Originalplänen neuerrichtete Honmaru Palast mit seinen vergoldeten Schiebetüren war besonders eindrucksvoll. 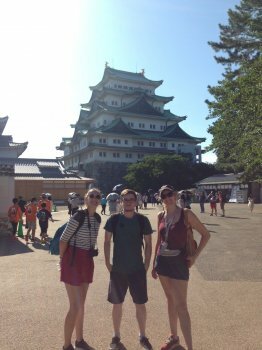 // The we finally arrived in Nagoya, where we visited the castle. 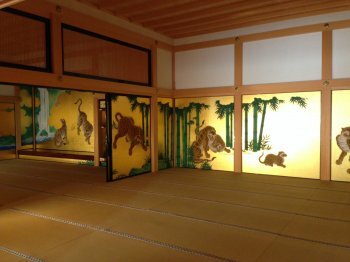 The sun was shining and eypecially impressive was the Honmaru palace with its golden sliding doors. It was rebuild lately after the original plans. Endlich in Tokyo! // Finally in Tokyo! 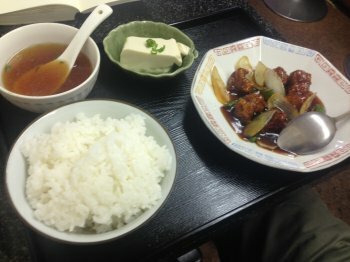 Das letzte Stück nach Tokyo verging in Höchstgeschwindigkeit, da wir mit dem Shinkansen Schnellzug fuhren. Am Abend genossen wir die Skyline vom Dach unseres Kapselhotels. // The last bit of our way to Tokyo passed by in high speed, because we took the Shinkansen bullet train. 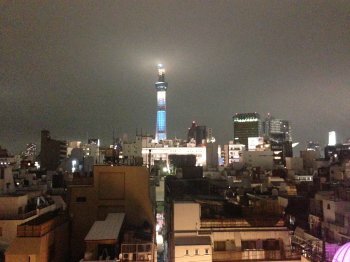 After checking into our capsule hotel we checked out the nightview of Tokyos skyline. 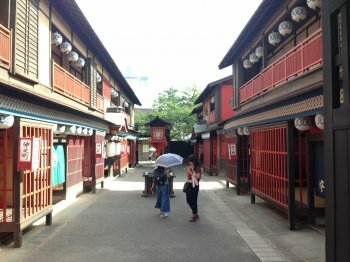 Unser Tag begann mit einem Rundgang durch unser Viertel, Asakusa. 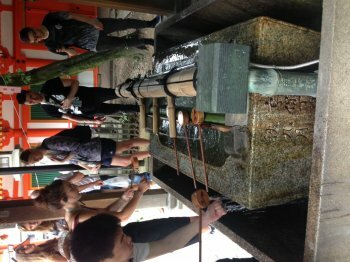 Wir besuchten den Senso-ji Tempel mit seinem berühmten Donnertor, Kaminarimon. Und ratet mal wen wir da fanden: Raijin den Donnergott und Namensgeber unserer Gruppe. Raijingroup Yeah! 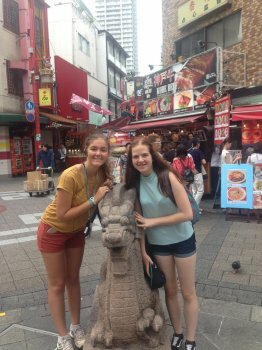 // Our day started with a walk through our quater, Asakusa. 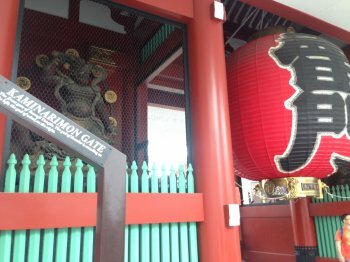 We visited the Senso-ji temple with its famous thunder gate, Kaminarimon. And guess who we found there: Raijin, the god of thunder and name giver of our group. 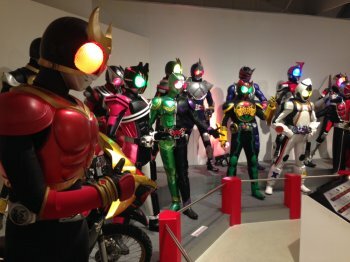 Raijin group yeah! Weiter ging es in den Hamarikyu Garten, indem einst die mächtigen Shogune entspannt haben. Eine kleine Schale grünen Tees passte hier perfekt. 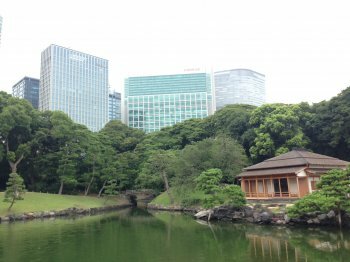 // Next stop was Hamarikyu garden, where once the powerful shogun used to relax. A bowl of green tea just fitted perfectly. 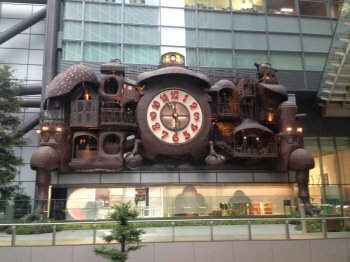 Im Stadtteil Shibuya hatten wir Zeit zum MIttagessen und Shoppen. Wir konnten uns kaum sattsehen an all den Geschäften und blinkenden Bildschirmen. 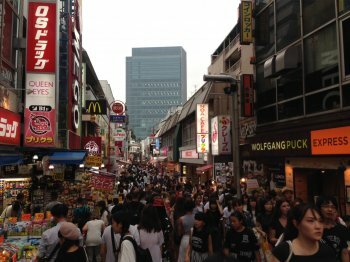 Danach schlenderten wir weiter nach Harajuku, das mindestens genauso geschäftig war wie Shibuya. // In the district of Shibuya we had some time to get lunch and go shopping. Some of us couldn't get enough of all the stores and the blinking screens. After that our guide let us to Harajuku youth district, which was as busy as Shibuya. Am Ende ging es noch auf das Rathaus der Stadt, aber leider war der Blick aufgrund des Wetters nicht ganz so schön. 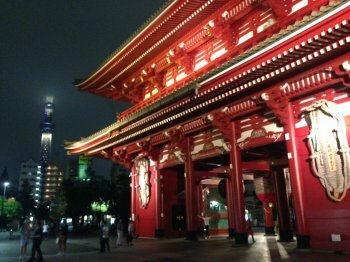 Umso besser war unser Weg zurück ins Hotel durch das abendliche Asakusa. // At the end we went up the metropolitan government building, but due to the unstable weather the view wasn't that good. But the walk back to our hotel definitely was! 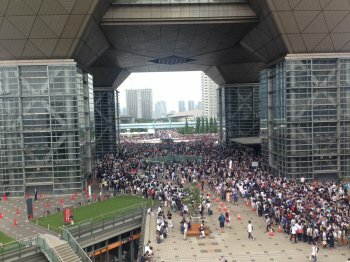 Heute stand alles im Zeichen der Comiket (Kurzform für Comic Market), einer Messe für Manga und Anime von vornehmlich Amateurzeichnern und Fans. Mit dem Schiff fuhren wir nach Odaiba einer künstlichen Insel in der Bucht von Tokyo und wir checkten Cosplays und Mangas aus. // Today everything was about Comicet (short for comic market), a fair for anime and manga by mostly amateur drawers and fans. 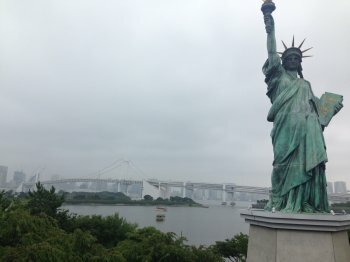 We got to Odaiba, an artificial island in the bay of Tokyo, by boat and checked out the cosplays and mangas. Es war ganz schön was los und so entschieden einige von uns sich noch den Rest der Insel anzuschauen. 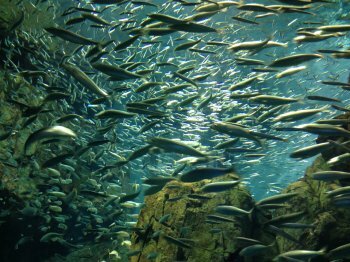 // It was pretty crowded, so some of us decided to have a look around the rest of the island. Wir besuchten das Venus Fort, ein Kaufhaus im Stile einer italienischen Stadt und einen Toyota showroom für die Autoliebhaber unter uns. 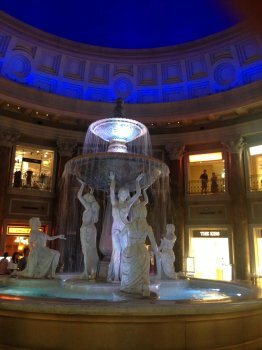 // We visited the Venus Fort, a shopping mall in the style of an old Italian city and a Toyota showroom, for the car lovers among us. Auch der Blick auf die Skyline war den Fußweg wert. // Also the view of the skyline was worth a walk. Mit dem Zug ging es heute in die Berge, nach Nikko. 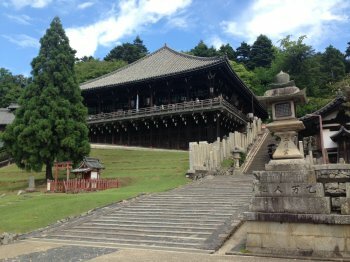 Eigentlich ist Nikko ein kleines Dorf, aber aufgrund der Tatsache dass hier berühmte Tempel und Schreine stehen, kommen viele Touristen. Einer von ihnen wurde grade renoviert und wir konnten bei den Arbeiten zusehen. // With the train we went into the mountains today, to visit Nikko. Nikko is a small village but due to the fact that there are a couple of famous temples and shrines here, a lot of tourists visit the place. One of the temple was under renovation and we could see how the workers renewed the roof. 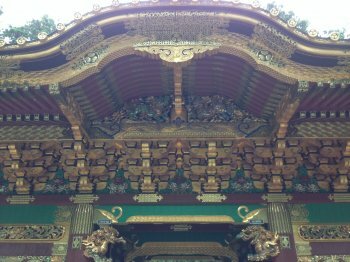 Im Anschluss ging es zum wichtigsten Ort in Nikko, dem Toshogu Schrein. 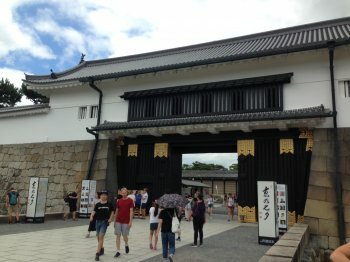 Hier liegt der Shogun und Reichseiniger Tokugawa Ieyasu begraben und wacht über das Land. 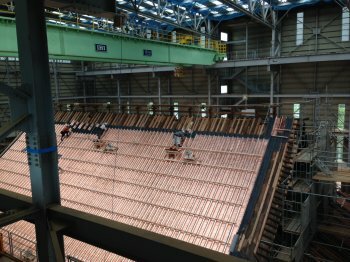 Die Anlage mit den vielen Schnitzereien ist wirklich beeindruckend. // After that we went to Toshogu shrine, the most important place in Nikko. Here lies Tokugawa Ieyasu, shogun and unifier o the country, in his tomb and protects the country. The complex with its many wood carvings is truly impressive. Die Lieblingsschnitzerei scheint die schlafende Katze zu sein. Wahrscheinlich weil sie so niedlich ist. // The most popular carving among the Japanese seems to be the sleeping cat. Perhaps because it's so cute. In der Nähe liegt auch der Enkel Tokugawa Ieyasus begraben, der mit seiner Mausoleumsanlage seinem Großvater nacheiferte. // Not far away lies the grandson of Tokugawa Ieyasu, who followed with his impressive mausoleum in his grandfathers footsteps. 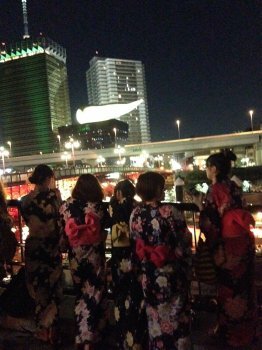 Als wir abends zurück in Tokyo eintrafen, fand gerade ein Laternenfest zum Gedenken der Toten auf dem Sumidgawa Fluss statt. // When we arrived back in Toyko in the evening, we were lucky and ran into a lantern festival at Sumidagawa river, where the Japanese remembered the dead. Heute kam endlich der Tag auf den wir alle gewartet hatten. 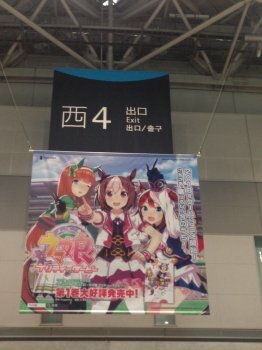 Unser Ziel hieß Akihabara das Mekka für Manga und Anime Fans, aber vorher besuchten wir den Ueno Park. // Today was the day all of us were waiting for. 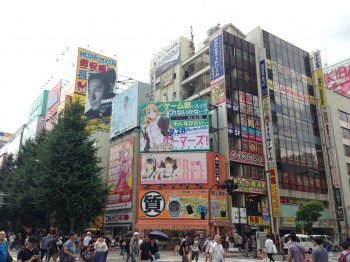 Our destination was Akihabara, the Mekka of anime and manga. But before that we visited Ueno park. 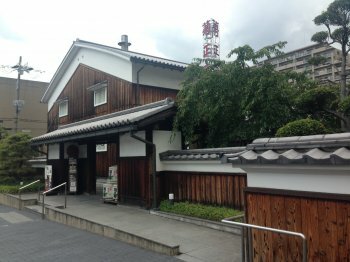 Mittag machten wir auf der in der Nähe des Parks gelegenen Ameya Yokocho Straße, wo frische Waren angeboten wurden. 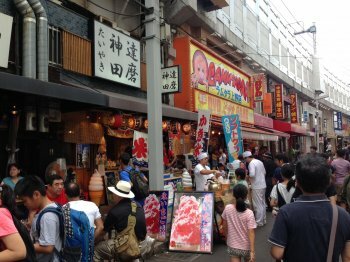 // We had our lunch break near the park at Ameya Yokocho street, where fresh products were offered. Dann waren wir endlich in Akihabara und schon ging das Shoppen los! 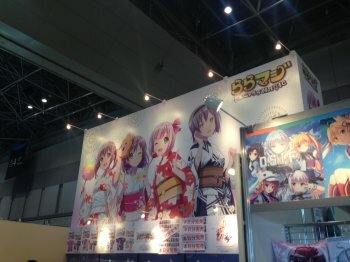 Alles war voller Manga, Anime und Elektronik und manche von uns besuchten sogar ein Maid-Café. // Then we finally arrived at Akihabara und instantly th shopping started! Everything was full of manga, anime and electronics and some of us even went to a maid café. Heute war unser letzter Tag und den hatten wir komplett zur freien Verfügung. Es wurden die letzten Taschen mit Souvenirs gefüllt, Snacks probiert und Fotos geschossen, bevor wir abends ein gemeinsames Abschiedessen hatten. // Today was our last day, which we had totally free for ourselves. Last bags were filled with souvenirs, snacks were eaten and pictures shot, bevore we had our farewell dinner. Mit dem Zug ging es heute zum Flughafen und schon ging es zurück in die Heimat. Sayonara Japan, schön war es mit dir! // With the train we went to the airport and took our flights back home. Sayonara Japan, it was truely wonderful!